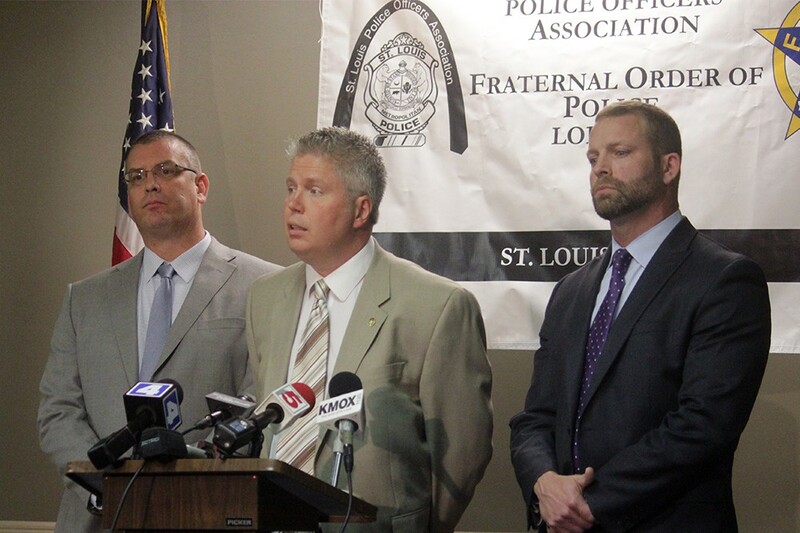 (Left to right) St. Louis Police Officer's Association President Joe Steiger, business manager Jeff Roorda and attorney Brian Millikan during an October 2014 press conference. Alderwoman Lyda Krewson accepted the endorsement of the St. Louis Police Officers Association — but she is not accepting the latest set of controversial remarks from its spokesman, Jeff Roorda. In a statement this evening, Krewson strongly condemned Roorda's comments about her opponent, Tishaura Jones, and called for him to be fired. "Today I call upon the elected leadership of the St. Louis Police Officers Association to fire Jeff Roorda," she said in a prepared statement. "When I am mayor, he will not be welcome in my office." In a Facebook post on his personal page, which was captured by the St. Louis Anti-Racist Collective, Roorda accused Jones, the city's treasurer, of being a "daughter of a felon," "laziest legislator of all time," a "cop hater" and a "race baiter." He also noted Jones' $22,000 in travel reimbursements, calling it "massive expenditures of public dollars." Roorda has been criticized strongly in the past for blaming then-President Barack Obama for the shooting of police officers in Dallas, saying he had "blood on his hands." At the time, there were numerous calls for his resignation, but he continued to enjoy the union's support. It will be interesting to see if that continues now that Krewson, the mayoral candidate most sympathetic to the police union, has made it clear she won't work with Roorda. Fellow mayoral candidates Alderman Jeffrey Boyd and Alderman Antonio French also waded into the controversy. French, for his part, blames Krewson, saying her past silence "enabled Roorda's dangerous rhetoric." Krewson's statement is below in its entirety. Jeff Roorda, Business Agent for the St. Louis Police Officers’ Association directed vile and disgusting comments towards Tishaura Jones today. Tishaura and I are both candidates for Mayor and are competing hard against each other but I absolutely reject his despicable characterization of her. She is a respected government official and does not deserve this abuse. This is not the first time I have felt the need to repudiate Mr. Roorda for his statements. He justified today’s repulsive remarks by claiming he had been attacked first by Ms. Jones. That excuse is not acceptable to me. I have seen police officers treated far worse by citizens on the street and still completely maintain their composure and civility. Today I call upon the elected leadership of the St. Louis Police Officers Association to fire Jeff Roorda. When I am mayor, he will not be welcome in my office. We will expect the police officers to send someone who is truly representative of them—someone who behaves respectfully and respectably. 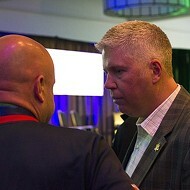 Jeff Roorda has shown that he can not. Editor's note: A previous version of this story gave incomplete information about the source of Roorda's Facebook post. 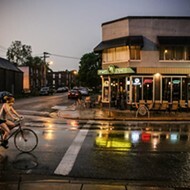 It was captured by the St. Louis Anti-Racist Collective and then shared by some journalists on social media.